Broad strategic choices in CFR revolve around when you spend your wear. 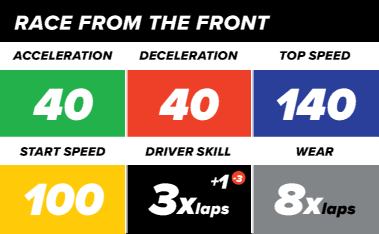 The strategy hints below mention splitting races into thirds. For a 3 lap race, that’s easy: one lap is 1/3 of a race. For other numbers of laps, note that the stop watch symbols next to the track split each lap into thirds. For a four lap race, passing your fourth stop watch will signal the beginning of the second third of your race. Do you spend wear evenly and efficiently though out the race, do you spend more wear early to gain a lead (race from the front), or do you save wear for a charge later in the race (race from the back)? For your first race, pick a strategy that sounds fun to you. As you become more familiar with the game you will notice that some tracks lend themselves more to one strategy or another. You will also notice that every strategy tends to work better when lots of other drivers aren’t trying to do exactly the same thing you are. Your pole bid and where you end up on the starting grid is also an important factor in your success. If your strategy is to spend wear early and race from the front, you probably want to bid enough to be on pole or near the front of the starting grid. But if you bid too much it may be too easy for the drivers behind you to catch up. If you bid too little you could end up with too many people ahead of you on the grid for your planned strategy to work. Below are some pre-built cars for three generic strategies and some thoughts on driving them. You will want to bid roughly twice the number of laps you are racing or a little more. Ideally you want to win pole. Look around at the other car set-ups: other cars with 100 start speeds are also likely to try to win the pole bid. Primarily use skill for the bid, but save 1, -1 chips to push your start speed on your first turn. You may have to use some wear for your pole bid in addition to skill. During the first third of the race, you want to spend wear to go as fast as possible. Try not to spend wear in two corners on the same turn, but do spend extra if it gets you through a corner before a straight. Budget half of your total wear for this first part of the race. If all went well, you will spend the rest of the race trying to stay in the lead you have built. You will want to bid roughly the number of laps you are racing. Your goal is to be in the middle of the starting grid. Primarily use skill for the bid. Maybe just use skill, saving all your wear for the race. Split up your wear into three even piles. Try to spend 1 pile of wear in each third of the race. You want to be very efficient. If you know you will be stuck in the same corner two turns in a row, it might be a good time to spend 2 wear for maximum effect. Go ahead and bid nothing for pole. You don’t really care. If you think lots of people are going to bid nothing (they probably also have a 20 start speed) and you don’t want to start dead last, bid some of your skill but do not bid any wear. Spend the first third of the race trying hard not to spend any wear at all. Use your 80 acceleration and 80 deceleration to go as fast as you can between corners without having to spend wear in corners. Then split your wear into two piles and spend one pile during the middle third of the race and the rest during the last third of the race. Use your high top speed and maybe even push that top speed to pass slower cars in the straights.